If you don't like mushrooms you can use cubed butternut squash or asparagus or almost any vegetable. If you have any left over, it can be shaped into balls (using wet hands) and deep fried for another meal the next day. That's so good you might make too much on purpose...! 2. In another large pan, heat the butter and olive oil together and fry the onion for 2 mins to soften. 3. Stir in the mushrooms and cook for another 2 minutes. 4. Add the rice, stirring for a minute to coat all the grains with the oils. 5. Pour in the wine, and cook over a moderate heat until the wine evaporates. 6. Add one ladleful of the hot stock. 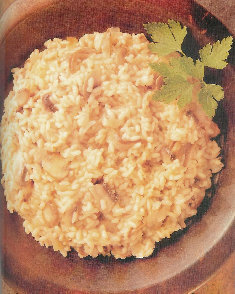 Over moderate heat cook until the stock is absorbed, stirring the rice with a wooden spoon. Continue adding the stock a ladleful at a time then stirring until the liquid is absorbed - this will take about 20 minutes. Don't let the risotto get too dry - when you add the parmesan it will become thicker and the finished dish should still be quite wet. Add more stock or hot water if necessary. Taste the rice, and add salt and pepper to taste. 7. When the rice is cooked (taste a little to check it's soft), remove from the heat and stir in the parmesan cheese and most of the parsley. Serve hot, sprinkled with the remaining parsley. 1. Make the stock in a large saucepan and keep it on a low heat.